Overview: Pengoloo is a memory game for little kids—the wooden penguins hide colored eggs, and the goal is to find the eggs that match the colors rolled on the dice. Who Will Like It? If you’re tired of just playing Memory with your little ones, this is a fun alternative with somewhat different gameplay. 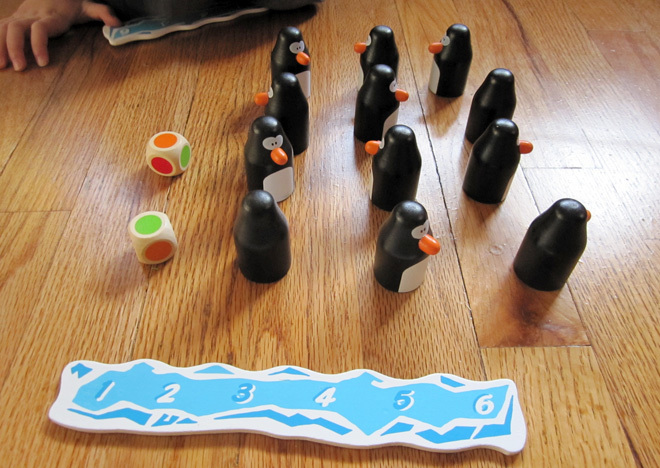 12 wooden penguins, 12 wooden eggs (in six colors), four wooden iceberg scoring boards, 2 colored dice. All of the components are wooden, and the penguins are really cute. The eggs are sort of gumdrop-shaped so they sit up under the penguins. 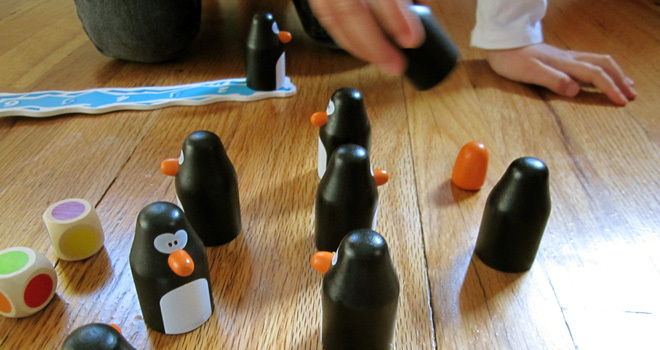 I did find it a little tricky to shuffle the penguins around (with eggs inside) without knocking them over, but if you’re playing with young kids you won’t need to do a whole lot of mixing anyway. It’s pretty simple: cover the eggs, mix them up, and then take turns rolling the dice and looking for the matching eggs. When you find a match, you claim the penguin and the egg and place them on your iceberg. First to six wins (and if you run out, then highest number wins). The one twist I should point out is that if you match both colors, you get another turn. Where it gets tricky is when both eggs of a color have already been claimed. In that case, you can uncover eggs on the other players’ icebergs as well. You won’t be able to take their penguins, but you can shoot for an extra turn. The rules also suggest variations in which you can steal penguins and eggs from other players, for older kids. 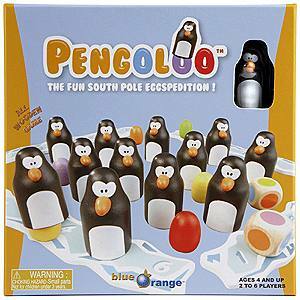 I’ve played this a few times with my kids and it was pretty fun—the little wooden penguins are certainly more fun to play with than just flipping over cards for Memory, and I actually found that I had trouble remembering myself where eggs were—especially the ones that had already been claimed. I like that you can check under penguins that other players have taken, because it means that just because it’s been claimed doesn’t mean you can forget where it went. The kids also like just playing with the penguins as toys, too. And since there are two of each color, you could (if desired) scrap the dice and scoring icebergs and just look for matching pairs. If you’ve got young kids and you need a simple game for them, Pengoloo is a good addition to your library. Wired: Cute and nicely crafted wooden pieces; fun twist on Memory. Tired: Penguins can be hard to mix up without tipping over and revealing the eggs. ← Reminder: Star Wars Art: Visions – With a Giveaway!